I have a bit of a cold and didn't make many beads yesterday, nor will I make any today, so I'm contenting myself to working with the beads and photos I have. These pictures were all taken by me with my cheap camera so they sock. 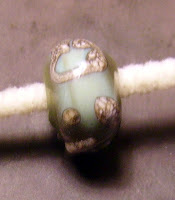 To the left is a copper green bead made on a 3/16 mandrel, decorated with some heavily silvered sis. I wish I had more reproduceable results with the sis. I imagine lots of practice will help this. I had an issue with some of the scrolls I made being so lightly adhered they cracked off, so I really melted this in. The reduction or devitrification on the ends of this bead bear witness to this. Not what I was hoping for but it works for this bead. A favorite quote I have that could have come from any ethnic grandmother would be "Experience is what you get when you don't get what you want." I made the mistake of saying this to Joe, and he said, "Or underwear." Just goes to show that you shouldn't try to get too clever in the face of practicality. 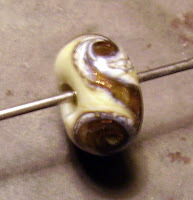 This next bead is also copper green with sis scrolls, melted in flush but the bead didn't do that bronze metallic thing. Now how do I get one result consistantly? I think the dropping gas level in the cylinder played a roll in the first and the next bead in the batch I made last night. Below is a bead made from plum silver dark, with sis decoration. I devitrified the heck out of it and tried to correct it by reheating in a neutral flame until it was molten again. The surface coating only got thicker no matter what heat was applied so I'm not sure what was going on. I like this one, taken from 3/4 view in the left picture and straight on the side in the right one. 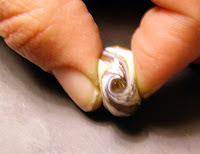 It is dark ivory with sis and goldstone swirls. I made this on a 3/16 mandrel with an eye toward eventual bottle opener mounting. 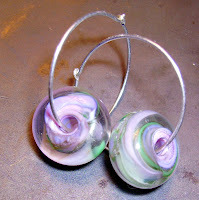 Finally a pair of hoop earrings I had been dying to try, made using the technique of heating a rod of clear, coating it in frit, in this case homemade pink and green, and proceeding to make the bead with this multicolored rod. I think they turned out nice, sorta hoping for an early spring. Next time I use this type of hoop I'm making the holes a tad smaller.